Edited by River Horse, 07 January 2019 - 01:43 PM. MSVCR100.DLL is a Microsoft Visual C++ file and is required by applications which were made with Visual C++. This includes many apps, including games, media players and more. Download and install all Windows updates including Microsoft Visual C++ 2010 Service Pack 1 from the Microsoft download link. Sorry, what more updateds? On that page there seems to be only one program, Visual C++ 2010 Service Pack 1. Or is there anything else to download / install? But I guess, after installing Visual C++ 2010 Service Pack 1 Win automatically will download the update 4. So I should download all of those 3 versions? Edited by River Horse, 07 January 2019 - 04:08 PM. If you have 64-bit version of Windows 10 download vcredist_x64.exe. If you have 32-bit version of Windows 10 download vcredist_x86.exe. Edited by River Horse, 08 January 2019 - 04:24 AM. Try installing updates for Windows it may have update for Visual C++. 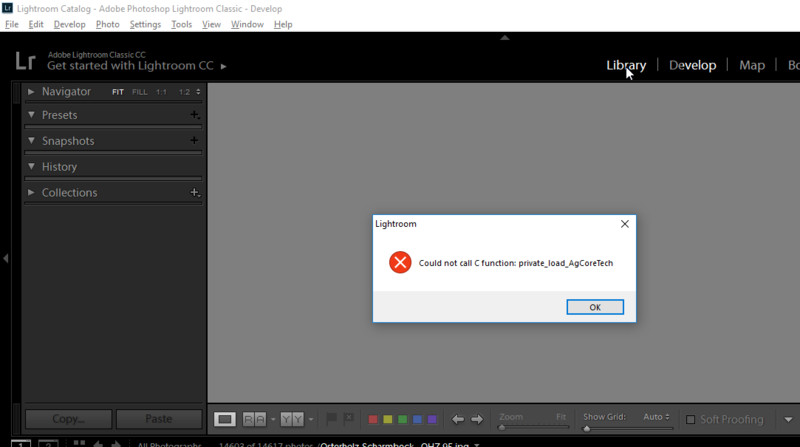 "Error 'Could not call C function: private_load_AgCoreTech' while launching Lightroom on Windows"
Thank you. But which of them should I install? Do I have to restart the computer (each time after installing / copying those files / Visual versions)? Try installing 32 bit version of below Visual C++ see it will resolve the issue. 32bit is this one: vcredist_x86.exe? Edited by River Horse, 08 January 2019 - 06:32 AM. Yes vcredist_x86.exe is the 32 bit version. Restart your computer if ask to do so. Alright, done. No restart requested. Lightroom does not start anymore, I will try again after a restart. If nothing works install latest version of Visual C++. Edited by River Horse, 08 January 2019 - 01:31 PM. Download the Microsoft Visual C++ Redistributable for Visual Studio 2017.